The air is sweet with the scent of the warm velvety carob emulsion. Cocooned in a mille feuille of warm towels and blankets my therapist moves to the bottom of my waterbed and gently sways my feet from side to side. The bed ripples sending soporific waves through my body. It continues to oscillate and then begins to retract and softly hug in against my body. Akin to a soothing bear hug, the opening and retracting motion is heavenly and with every ‘out breath’ my muscles sink further into my towel cocoon. The warm carob mask feels deliciously luxuriant against my skin – no doubt infusing it with radiance to make me look 10 years younger – and the whole experience is so tranquil I am soon lulled to sleep. An hour earlier, I had arrived at Serenity – The Art of Well Being spa (www.pinecliffs.com/en/serenity-spa/) and was greeted by the friendly and uber-professional staff. The 1,100m2 spa space is a cornerstone of the Pine Cliffs, A Luxury Collection Resort, experience and beyond the tranquil double-height reception lies a labyrinth of beautifully appointed rooms including two that boast the incredible oscillating waterbeds, and one traditional Thai Massage suite. Two dark-wood corridors form the artery that connects the inner sanctum of treatment rooms to the Thermal Oasis, which houses the pools and wet area. 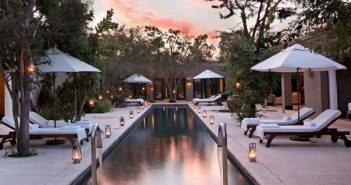 The low-lit vibe is instantly calming, feeling a world away from the sunshine-drenched pools and golf course that lie metres away in the Pine Cliffs property. The textured walls, soft furnishings and trickling water features gives the spa a restful Asian ambience. Quiet, contemplative and calming, the relaxation area has low-slung loungers and cosy rugs, while at the end of the corridor the Thermal Oasis has a plethora of pre-treatment muscle soothing offerings. A cascading curtain of glittering glass beads separate dreamy day beds (which all face out towards the quiet and private spa garden) and the thermal and hydro pools indoors. It’s not unusual for a spa to offer guests the opportunity to steam, swim and sauna pre treatment but Serenity Spa’s thermal pool area is not only capacious but has a steam bath, Kneipp Pool, indoor hydro pool, herbal sauna, Himalayan rock salt sauna, ice fountain, experience showers, outdoor Jacuzzi hot tub, indoor and outdoor relaxation loungers and a hammam suite you can book for treatments. It’s October when I visit – and 28C for the entire five days of my getaway – so I give my circulation a boost with the hydro pool jets, lie back on the immersed water loungers and then bask in the rays in the walled garden. But even if it were raining cats and dogs this mainly indoor facility would be perfect and the outdoor hot tub, a bubbling spot to relax and revive al fresco (it’s covered by an awning, as well). After an hour in the Thermal Oasis, I’m ushered to my room for my Senses of the Algarve treatment. Asian spa influences continue to permeate the styling to great effect; an orb wall light gives the room a soft glow and my therapist shows my the local sea salt scrub, Carob powder and essential oils laid out in petal-shaped bowls with a gold chalice mixing pot. A scrub of Fleur de Sel from Ria Formosa – a five inlet lagoon just a couple of miles away – and sand from the resort’s Falesia beach – steps away – is carefully applied first. The salt scrub is not too harsh – I once was rubbed raw during a salt exfoliation in Spain and spent 20 minutes grimacing into the towels – and invigorates my body in long sweeping buffs. Once showered my tingling skin is then slathered with the rich and deliciously gloopy carob mask. One of the most famous organic products from the Algarve and naturally rich in selenium, the warm fondant-like wrap soothes and nourishes my skin. A thin plastic sheet is wrapped around me, followed by a swaddling of warm towels. The aforementioned waterbed waves then begin, lulling me into one of the most enjoyable spa snoozes I’ve had in a decade. 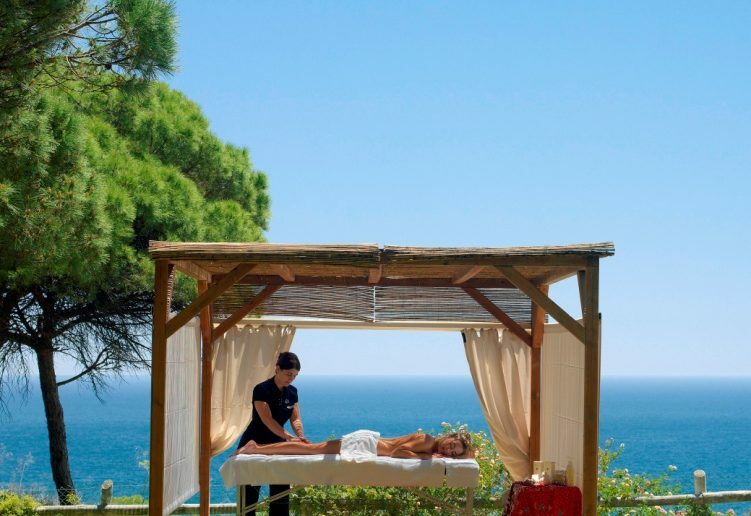 As the bed expands and retracts, gently massaging my towel-wrapped body, my therapist administers a spine-tingling head massage, followed by a full body massage with a delicately scented orange-oil from the Algarve. The steps are seamlessly managed and every time I return to my cosy treatment bed from the in-room spa shower, there is a divot of new fluffy towels beckoning. I glide across to the relaxation room in a post-treatment daze and enjoy pin-drop silence and a local lemon grass tea. My skin is glowing and it feels like I’ve shed the stresses of everyday life in one sitting. Adjacent to the relaxation room is a slither of courtyard with a clutch of day beds where you can relax outdoors as well. Though not totally private – there are guest rooms a couple of storeys higher up – the glass-fronted outdoor fireplace will make this space feel particularly cosy on crisp winter afternoons, and if you do want total privacy the Thermal Oasis garden next door is always on hand. For couples and small groups, the new and private Aurum Suite can be booked. Boasting a private sauna, steam room, experience shower, colour-changing Jacuzzi – oh, and gold brick walls – this sumptuous suite comes with complimentary champagne and chocolate-dipped strawberries. All spa treatments can be added to your experience in the suite’s double treatment room and though almost ridiculously opulent, it’s a really enjoyable experience. Though the Algarve is well known for it’s balmy year-round climate (its ochre cliffs are drenched in sunshine 300 days of the year), the resort attracts many guests during winter and shoulder season. While the Serenity Spa is a fab spot for winding down with your loved ones, activity hunters can enjoy the walking, hiking and cycle routes from the doorstep, the nine-hole Pine Cliffs golf course, state-of-the-art-gym and Annabel Croft Tennis Academy with five floodlit tennis courts and a padel court and the whole site also perches above one of the Algarve’s best beaches. Despite its six pools, 11 restaurants and lounges, its golf course and sports facilities, Pine Cliffs never feels gargantuan, nor built up, but has the air of a long, winding Mediterranean village. The complex comprises the Pine Cliffs Hotel, the new Pine Cliffs Ocean Suites, A Luxury Collection Resort & Spa, and Pine Cliffs Residences. The properties occupy arresting cliff top positions, with views spanning out across the pine forests, undulating greens and soft sands. Our room is located in Pine Cliffs Ocean Suites, a contemporary residence of one and two-bedroom apartments. It’s stylish, chic and modern and the high-end kitchen gives the option to be a little more independent. The new gym and health club together with Zest restaurant, which speciallises in healthy breakfast lunches, smoothies and juices, also hints at Pine Cliffs’ newest focus – wellness breaks. With personal trainers, fitness classes, yoga, zumba and bespoke wellness programmes, guests looking for a health kick or a kick start will be happy. Programmes include digital detoxes and fitness sessions to seven-night yoga and harmonization of the chakra sessions. 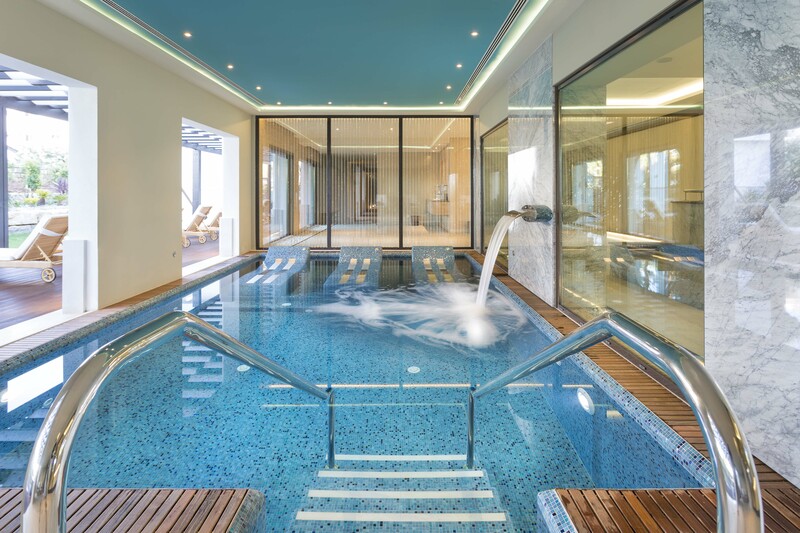 In a resort that caters to families and adults and has a whole lot going on, it’s pleasing that the spa and its wellness offering is so well thought out; a proper destination that will be a sanctuary for most guests looking to revive and relax. Tel: +351 289 500 100.